The most important message we have is to encourage prevention. Decay, infection and lost teeth can be prevented. At your hygiene visit we'll formulate a personalized plan to reduce these problems from occurring. Often times we hear patients say that they have bad teeth because of genetics and therefore teeth problems cannot be prevented. This is a big misconception. Our personalized hygiene and maintenance plan for you will include ways to overcome this heredity factor. We also will update and modify your plan at each visit based on the success or failures we find. We will discuss your diet, hygiene habits and life stresses that contribute to dental problems. We will be your coach and cheerleader to encourage you to reach your goals of having a great smile to be very proud of!! As a dental team we constantly reevaluate the latest studies and our personal observations to change our recommendations based on the current research. There are dental products that come and go constantly. Some of these product are an improvement and others are not. If you find a product that you love or that you have concerns about, ask us! We can spread the word about the success or shortcoming of over the counter dental products. There is not one answer to what is the best toothpaste, toothbrush or floss. There are many different products because there are many different types of people. There is a large variety of factors to consider when recommending the best hygiene tools. 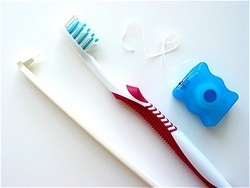 We take these factors into consideration and give you personalized hygiene recommendations. Don't discount the importance of regular hygiene visits. Every day we see people who regret not taking this advice who are either confronted with pain, a large dental bill or the loss of a tooth. This is completely avoidable with regular dental visits and following our home care recommendations! Prevention visits will save you from pain, loss of work and unnecessary expense! Even insurance companies realize this! Preventive visits are often covered at 100%! !